According to Vietnam’s third-cycle UPR national report which was announced at the seminar, the realization of the recommendations has exerted positive impacts across all aspects of society in Vietnam, especially in building human rights-related laws, ensuring social welfare, improving people’s living standards, and promoting cooperation and dialogues on human rights at regional and international levels. Vietnam’s per capita income has increased continuously and the income of poor households has risen from between 15-20 percent. Meanwhile, the multi-dimensional poverty rate dropped from 9.88 percent in 2015 to 7.69 percent last year. The report also pointed out challenges and limitations regarding the legal framework, resources and policies to promote and ensure human rights in Vietnam, especially those of disadvantaged groups. It also proposed priorities to the Vietnamese Government in order to ensure each resident’s improved access to fundamental rights and freedom. Addressing the event, Caitlin Wiesen, the United Nations Development Program (UNDP) Country Director for Vietnam, stressed the special significance of the implementation of the mechanisms to the UPR Working Group slated for January 2019. The UNDP will continue to coordinate closely with the Vietnamese Government to materialize mechanisms, thus contributing to better ensuring and promoting human rights in the country, she pledged. 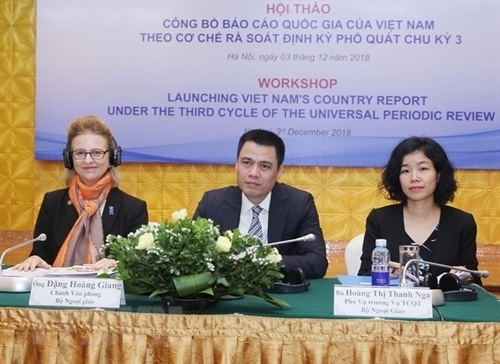 The third-cycle UPR national report, approved by the Prime Minister on October 17, 2018 and submitted to the UNHRC on October 22, 2018, was completed with the participation of 18 relevant Vietnamese ministries and agencies, said Dang Hoang Giang, chief of the foreign ministry office.